Says the release date is 9/27. I spoke to both a online and store rep and they said the date is legit although they cannot give a number on the units they will have. I nearly preordered on ATT Premier but backed off at the last minute. Will probably go to best buy where there will be no lines and get the new SGN3. who preordered their Note III via AT&T will also get it that day. Pre-ordering would cease to exist if customers could buy them in the stores before the pre-ordered devices delivered. People need to stop panicking and realize that if you pre-ordered your device and there are rumors of an earlier release at retail, that only benefits you. I am sure that Best Buy gets their phones shipped from the same place that you do. Just spoke with a BestBuy rep about the date. 1. He said that the phone WILL be available IN-STORE (obviously as well as online) on September 27th. 2. I asked why the phone was not available to chose in-store pickup. He said that the website will be updated to allow for in-store updates, but it will only be updated on the 27th. Take all of this with a grain of salt, of course. I did try two different representatives, 1 hour apart, using the chat feature (I like to do that just in case 1 is misinformed). Indeed, I got the same answer for both. Is this just for the at&t version or for all carriers? Good news. Good news indeed. Then what about the people who pre-ordered through AT&T?!? Does this mean their corporate stores will have them in store that day? When I say "in store" I don't mean on the shelves, but stocked in a backroom. I'm about to go into the city where a corporate store is, maybe someone will know. Only AT&T. As of now Best Buy only has the AT&T and Verizon version on their site of which only the AT&T version has a release date. ...makes me feel warm and fuzzy that I switched to AT&T back in June. They seem to get the toys in a timely manner. Thanks. I'm interested in the Verizon version...looks like I'll be waiting a lil longer than you AT&T guys. I decided to call a local best buy mobile store (the ones that only sell cell phone related stuff). The rep, at first, told me October 1st. I told him that I had spoken to a rep online, and the website says the 27th. He again said "our release date for is the 1st. If we get it before, we'll probably have to hold it in the back". I asked him to double check, since I believe he was wrong. He then asks me to wait a minute while he searches his system. 30 seconds later, he says "oh...it says September 27th now, you're right. I guess we'll have it that friday, but you should still call first just in case". "...oh...it says October 27th now...". I ordered my att note 3 through best buy. Mine is supposed to be delivered on 9/30 or 10/1. I get expedited shipping for free through best buy. Saves me a trip to the store. But then you have to wait the whole weekend! That's like.... 3000-5000 years of wait, when it comes to waiting for a gadget. XChrisX and kyrana like this. Will Best Buy match AT&T's off contract price of $729? Their website shows $799, which is a big difference. I would like to be able to order one from the Best Buy website early morning, and pick it up around Noon when I get the chance to go up there. Hrmmm, I wonder if AT&T will get them around that day as well. I stopped by my local BB and was told by a rep that they're not getting the Note 3 until October 12th and even if they get the shipment early, they can't sell them until AT&T (and other carriers) tell them they can. Well that's weird. That's even against information my local best buy told me, that they're getting Note 3's for sale on October 1st. Are you sure you're not talking about verizon only? You gotta be talking about Verizon Only. best buy literally competes with AT&T stores for activation. That would mean Best Buy is going to sit around and wait for almost 2 weeks until the 12th? That's crazy talk. iPhones gets AT&T their most activations / renewals, and even for iPhones best buy has them the same day as AT&T stores. 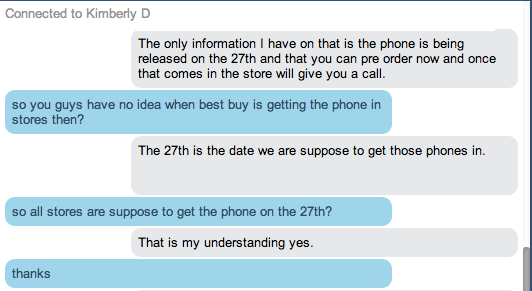 This is the 4th best buy rep to confirm the phone is being RELEASED on the 27th. After all the hell I went though with pre-order the Note 2 from AT&T, I will never pre-order from AT&T again. Hmmm if I don't see my AT&T pre-order ship in time for Friday delivery, I'll go to BB Friday morning and buy it there and cancel my AT&T pre-order. This is what I was told by a BB rep. Granted, I do live in KY so I don't put much faith in a lot of what people say around here. On another note, has anyone talked to AT&T about it? Best MicroSD for Note 3?